There’s a relationship between the size of a monkey’s brain and the size of its clan. It’s called the monkeysphere. The bigger the brain the bigger the troop. Some postulate the same applies to humans. When you’re on a journey, your world becomes very small. You care about the weather, who you’re with, when you will eat next, and where you will sleep. Over the last few days I noticed myself letting less space get between me and Kristen on the road. There are some days when your little world gets jolted. This was one of them. It started pouring down rain shortly after we left the hotel. About 15 miles later I saw a dog get hit by a car (right next to me but on the opposite lane). I threw my bike down and watched the dog limp across the road to our side where I managed to get a hold of it. Then people driving by saw me in the ditch on the side of the road and thought I had been hit by a car. When the owner showed up, I helped him get his dog (it was an Afghan hound) up the side of the ditch and into his car. He then drove off to the vet. I, like any good American without ready access to therapy, went shopping. I needed some long pants to give my legs sun protection on hot sunny days. 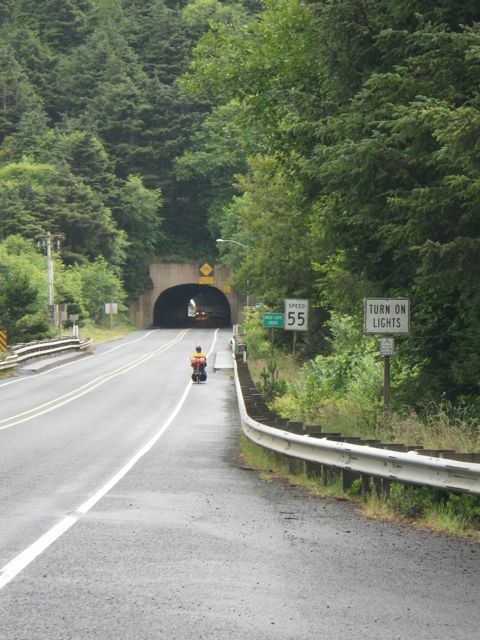 Later in the day, we rode through the first of two tunnels our route takes us through in Oregon. This was the long one. From our direction, it goes up hill and bends slightly to the left. Before you enter, you press a button that turns on some flashing lights indicating, “bicycle in tunnel”. Then you ride like the dickens to get through it to minimize the number of cars that drive through while you’re in there. By the way, it’s very loud in a tunnel when you’re on your bike. Approaching the Arch Cape tunnel. About a mile after the tunnel, I broke a spoke in my rear wheel (the one repair we weren’t prepared to handle). We then debated about riding back 10 miles to the bike shop in Cannon Beach or at least 75 miles to the south. Just then, a man pulled onto the road from a private drive in a huge pickup truck and asked if we needed help. His name was James and he told us about his laser-guided trailer hitch company that he started. He was driving his daughter to soccer practice in the direction of Cannon Beach. We put our bikes in the back of his brand new truck and he drove us to the bike shop, where I got my spoke replaced. It was still raining. The guy at the bike shop sent us to the Wave Crest Inn where we met another touring cyclist, Mike “the German”. I like the monkeysphere analogy! What an adventure! It sounds like the dog might make it thanks to you.